I love Mozambique. From the warm, brilliant blue waters to the endless white sandy beaches and tidal sandbanks, it is a seriously romantic destination. AZURA BENGUERRA ISLAND now has even more to tantalise your tastebuds with the imminent launch of the new, super fun PERI PERI BEACH BAR. Located a short walk along the beach, past the Presidential Villa, this relaxed, chic, barefoot beach bar will offer a Portuguese-themed barbeque-style menu, mixology cocktail menu and magnums from France. Interactive and fun meals together with a pool and massage pavilion make this the perfect spot to laze around. In the evenings, dreamy dinners under the stars end with beach cinema and bean bags. HONEYMOON HEAVEN - Say 5 nights or more and 1 spouse receives 50% discount. AZURA BENGUERRA ISLAND Beach Villa from US$ 695 pps. 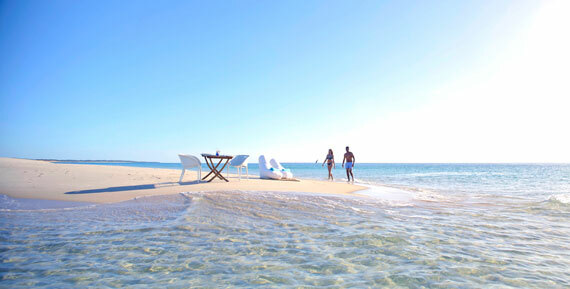 AZURA QUILALEA PRIVATE ISLAND Kaskazi Villa from US$ 825 pps. Great news for island honeymooners; Azura has now increased the discount from 40% to 50% for 1 spouse when staying for 5 nights or more. SAVE between US$ 1,737.50 and US$ 3,737.50 for 5 nights! UPGRADE — complimentary room upgrade now at booking level. MASSAGE — one treatment per person (couples massage not always possible). BUBBLES — a special bottle from the owners' estate, Château Pas de Loup, in France. Does not apply to Villa Amizade or Presidential Villa. Valid until 15 December 2019. The first 10 bookings: Azura will send you (our valued trade partner) a bottle of Château Pas de Loup bubbles. Use booking code HONEYMOON19. Azura Retreats' vision was to provide the ultimate in private luxury hideaways in stunning undiscovered destinations, and they have achieved this beautifully with both Azura Benguerra Island and Azura Quilalea Private Island.